BMW I8 hybrid the sports car of the future? BMW I Product Manager Jose Guerrero on the automaker’s new hybrid sports car. BMW hopes the combination of performance capabilities and an electric motor will give the new i8 hybrid an edge over competitors. The i8, which recently arrived in U.S. showrooms, has a 0-60 time of about 4.2 seconds and a top speed of 155 miles per hour. Meanwhile, the plug-in hybrid gets the equivalent of 76 miles per gallon, thanks to an electric range of 22 miles. “It can be an electric car when you need it to be, all the way up to 75 miles per hour. And then, if you want to have a little bit of fun, you can put it into sport mode,” Guerrero added. 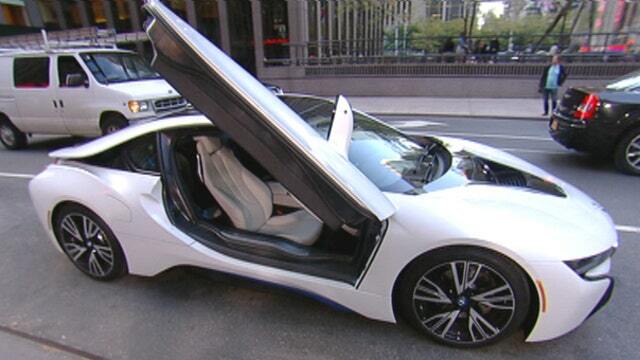 The i8 won’t come cheap with a starting price of $136,650, including the destination charge. As it went from a concept to the current production model, the i8 kept premium features like gullwing doors and a passenger cabin made of lightweight carbon-fiber-reinforced plastic. “Not only we were able to incorporate all those exciting design aesthetics and design language, but we were also able to bring the efficiency [up],” Guerrero said.